The Troutman group focus is on projects broadly interfacing chemistry, biology and physics, with specific interest in biomedical and nanoscale science. 1) Understanding and characterizing bacterial polysaccharide biosynthesis systems, with the eventual goal of developing new therapeutics or vaccines based on complex polysaccharide polymers. 2) Polysaccharide biosynthesis probes, with the eventual goal of being able to identify the role of complex polysaccharides in nature. 3) The development of novel selective inhibitors of the enzyme Undecaprenyl Pyrophosphate Synthase, a protein critical to bacterial survival. 4) The design and production of novel bio-based nanomaterials. 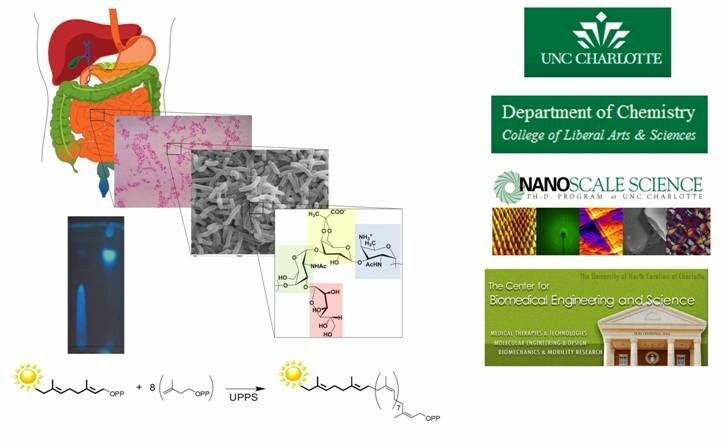 The Troutman Lab is affiliated with three graduate programs at UNC-Charlotte including the Chemistry M.S., and Nanoscale Science Ph.D..Our group is also affiliated with the Center for Biomedical Engineering and Science. We are currently funded through National Institutes of Health.